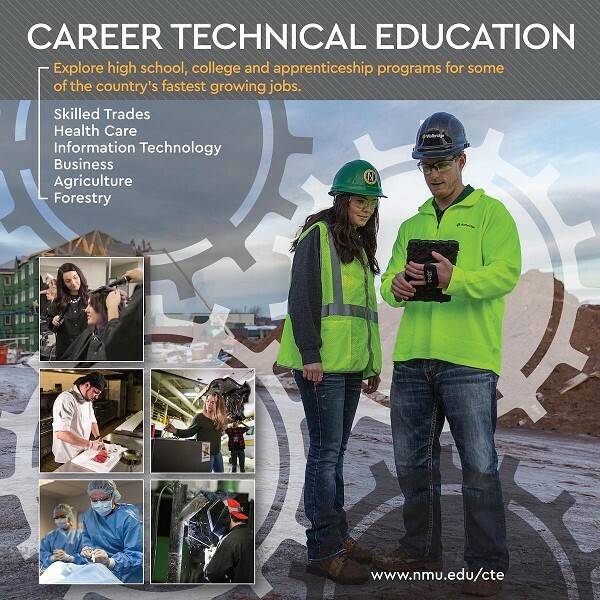 Northern Michigan University graphic graces cover of Tech-Ed brochure. Big changes in Michigan's educational programs are in high gear under the leadership of Gov. Rick Snyder. Students need better access to career pathways and schools need more support to enhance programs if Michigan is going close the talent gap and continue building a more prosperous future, the governor said. There are about 108,000 CTE (Career Technical Education) students in Michigan with 15,000 skilled trades jobs available at present. The sector employs more than 200,000 persons. Snyder's remarks came recently while unveiling a comprehensive series of actions and recommendations to upgrade technical education. Proposals include expanding and strengthening career technical education statewide through a series of approaches, including curriculum changes, increased collaboration between educators and employers, and added resources for students to discover and prepare for potential opportunities. Locally, Delta College and the Bay-Arenac Career Center are stressing technical education while a new initiative, School-to-Work Pathways is in developmental stages of a STEM Pre-Apprenticeship Opportunity Center aimed at retrieving high school dropouts and connecting them with employers in Bay City. "We all have an important role in making sure every student has the opportunity to explore multiple pathways to find a career that matches their interests and goals," Snyder said. "We call this effort the Michigan Career Pathways Alliance. We are bringing together economic developers, employers, and educators, as well as K-12 districts and higher education institutions with union leaders and businesses." The proposals complement the Governor's priorities from the 21st Century Education Commission report, including the statewide use of competency-based learning, creating more career paths for teachers, increasing access to post-secondary education, and holding the right people accountable. At Snyder's direction, Talent and Economic Development Director Roger Curtis partnered with State Superintendent Brian Whiston to work with stakeholders and gather valuable feedback. They have discussed challenges and concerns surrounding career exploration and job readiness, and then built recommendations to help Michigan residents, educators and job providers. States across the country are struggling to fill openings in the professional trades, and leading the nation in developing talent was a key recommendation of the report issued by Snyder's Building the 21st Century Economy Commission. "We need to change the perceptions of the professional trades so students, parents, and others know about the outstanding opportunities that are out there as Michigan businesses grow and thrive," Curtis said. "But that's only part of the job. Once we've shattered stereotypes, we need to have a stronger system in place for students to determine the best pathway for them, they have access to the rigorous training to get them to the job they want -- no matter where they live." The commission report also included recommendations to make Michigan a world leader in talent. Many of these recommendations, including increased funding for high school and at-risk students, a focus on competency-based learning, and more access to postsecondary learning, were adopted by the state Legislature during the budget process. Whiston has signed a directive setting some of the actions in place immediately. Others are recommendations that would require legislative changes or would be the first steps in an important discussion about addressing long-term challenges. "Every educator wants to see students reach their potential, and we're working to give them new tools to help," Whiston said. "Some of these changes present a different way of approaching these challenges, and we're looking to have Michigan lead the nation in developing talent at all levels. Career and college readiness is vitally important for our students, and for our communities and state as a whole." Create the "Rising Tide" (technical assistance teams) of professional trades programs -- Establish a Rising Tide model of partnership with local districts, employers, advocates, and training centers to help match what is being taught with community needs. Develop CTE/professional trades playbook -- Develop and provide a playbook of best CTE practices to schools and support those that need help implementing them. Match crowdfunding for counselors and professional trades programs -- A program to provide state-matching dollars through a crowdfunding program to assist in covering the costs for counselors and professional trades programs. Promote non-taxable deductions for professional trades instructors and curriculum development Expand CTE statewide -- Start the discussion to provide equitable opportunities for all students with additional funding to schools to operate CTE and professional trades programs statewide. Implement externships and out-of-classroom experiences -- Time spent by teachers and counselors engaging with local employers and technical centers will count toward continuing education and professional development. Ensure state-funded CTE programs lead to an industry-recognized credential -- Require an industry-recognized credential as determined by the state (TED and MDE) through discussions with regional employers. Count rigorous CTE credentials as transferable college credits -- Any institution that takes public money needs to accept and count these credits towards a degree from that institution. Use Michigan Transfer Network as the "referee" to determine the rigor of CTE credentials. Continue Going PRO campaign to change the perception of professional trades -- Peer-to-peer approach aimed at students, parents, educators, coaches. Will include paid media, website, social, blogs, video, career fairs, open-source sharing with stakeholders. The announcement was made at Brose North America, an automotive supplier that was a founding member of Gov. Snyder's Michigan Advanced Technician Training program and a sponsor of FIRST Robotics and SquareOne. The company this year is starting its first high school apprenticeship program, working with the Oakland Schools career program.